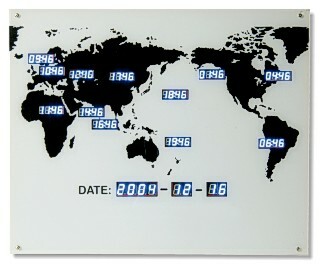 A fantastic digital world clock with 12 timezones and the date mounted within a sheet of glass. The world map land mass is printed as a mirror amongst a very pale blue sea. The major cities are black graphics and the digital LEDs are a very intense light blue, making it eye catching and certainly different. This clock would be an unusual feature in a modernist home, away from the expected office environment. It is 60cm wide by 50 cm high (23½ by 19½ inches approx). Mains operated and supplied with 1.5m of cable.